Home 2018 The Best Beaches in Orange County! We scoured the coast and came up with the top beaches in Orange County, no matter what you’re in the mood for. ➜ Corona del Mar State Beach draws swimmers, body surfers, and sunbathers. With top-notch eats (Page 75) and updated showers and restrooms, this long, crescent-shaped beach is comfortable and welcoming, so much so that summer parking is a challenge despite its large lot ($1.50 to $4 per hour or $15 to $20 per day depending on the time of year). Anyone who doesn’t mind the winding, steep path to the sand from Inspiration Point can park in the neighborhood above and admire the luxurious homes along Ocean Boulevard. Lookout Point—overlooking Pirate’s Cove and just north of the parking lot—lures lovers, out-of-towners, friends, and families for picnics and sunsets. ➜ Nearby: Little Corona Beach, down another steep path at the south end of Ocean Boulevard, is a family-oriented beach with tide pools. As the sun sets, it becomes a perfect background for portraits. ➜ Huntington Beach’s seemingly endless shoreline separates into Huntington City Beach, north of Beach Boulevard, and Huntington State Beach, to the south. No matter which side you fall on, you’ll find ideal conditions for surfing, swimming, and beach volleyball. Plus there’s an 8.5-mile paved trail, for those who’d rather take it all in on two wheels (or two feet), and one of the longest public piers on the West Coast (1,850 feet). Old-school snack shacks Dwight’s and Jack’s, along with newcomer Naugles, offer fuel for all this activity. North of City Beach lies Huntington Dog Beach, where pups chase waves and Frisbees and practice for the annual Surf City Surf Dog competition. Large lots ($1.50 to $1.75 per hour or $15 per day at the city beach, $15 per day flat rate at the state beach) and metered parking along PCH accommodate hundreds of cars—and it’s a good thing, given the size of the crowds that flock here all summer. ➜ Nearby: You might drive through the community of Sunset Beach on PCH, never realizing there’s a pristine 1.5-mile stretch of quiet coastline just a couple of blocks away. Parking is free, but limited. 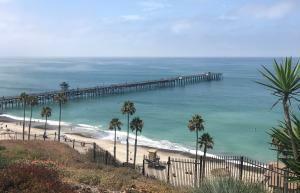 ➜ Ride the rails to San Clemente Pier to reach the heart of San Clemente Pier Beach without a car. Get your caffeine fix at Bear Coast Coffee, watch the surfing action from the pier, and walk up the hill to Casa Romantica for a killer sunset view. If you’d rather be cliff‑side than pier-side, try Calafia State Beach to the south. There’s a snack shack next to the parking lot ($1 to $2 per hour, $15 per day), restrooms, and lifeguards on duty. The beach itself is narrow, so don’t go during high tide. The water is clean, and the bluffs are majestic. 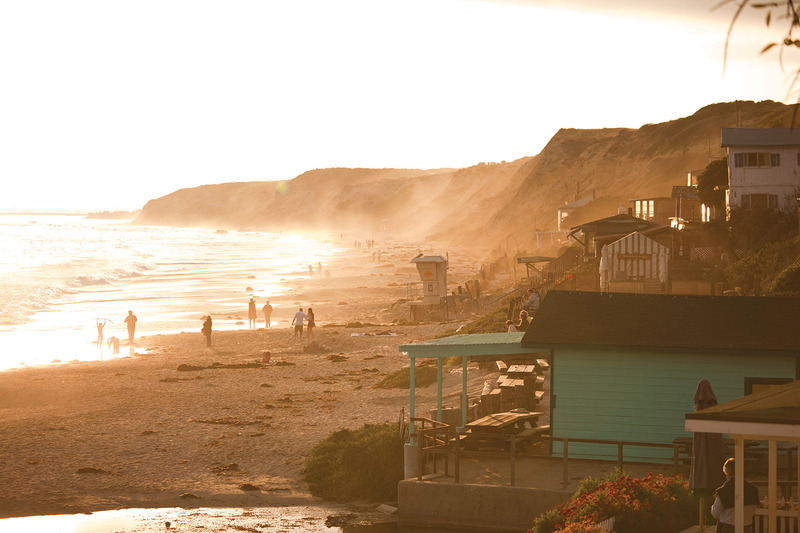 ➜ Nearby: The epitome of old-school cool, San Onofre State Beach is famous for its world‑class surfing conditions. ➜ For fantastic people-watching and great views, it’s hard to beat Laguna’s Main Beach. Active folks looking for pickup basketball next to the sand or those seeking a leisurely stroll along the boardwalk will be rewarded. Spend the day frolicking in the water and watching beach volleyball, or take a walk through Heisler Park. Grab lunch from Pizza Bar, where you’ll find baked pear and Gorgonzola flatbread ($10) and homemade hummus ($9). Capture a perfect photo of the sunset behind the historic lifeguard tower or join the Laguna Laughter Club any morning for stretching and giggles. ➜ North of the verdurous Dana Point Headlands, Dana Strand Beach is a long, narrow stretch of shoreline culminating in a cove that provides an air of seclusion. 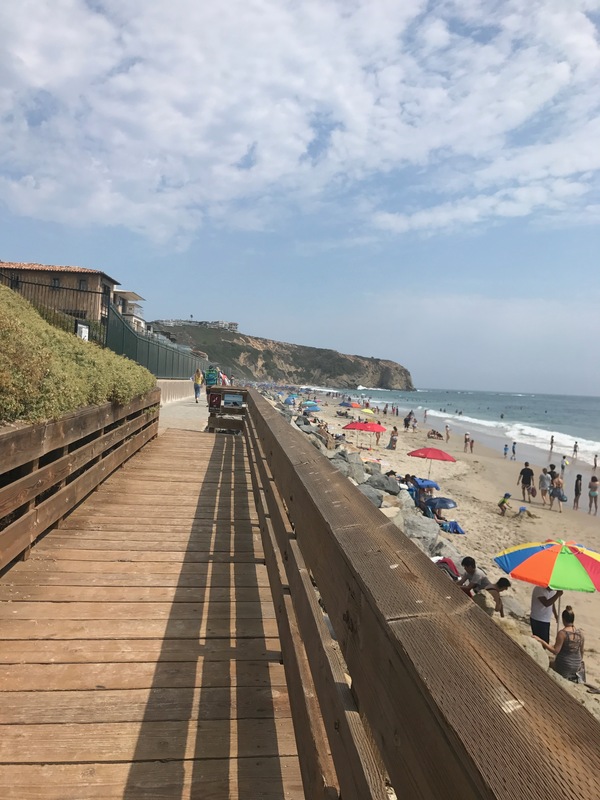 Take advantage of the free parking at Strands Vista Park and either trek down the paved stairway or ride the funicular (open during daylight hours in the summer) to reach the beach. To explore the Headlands conservation area, climb a staircase on the south end of the beach where restrooms and showers are also available. Or admire the rows of oceanfront homes as you traverse north via the wooden and concrete boardwalk. If you keep heading north past the end of the boardwalk, you’ll soon hit Salt Creek Beach, next to The Ritz-Carlton Laguna Niguel resort, where there is a large grassy park perfect for picnics. 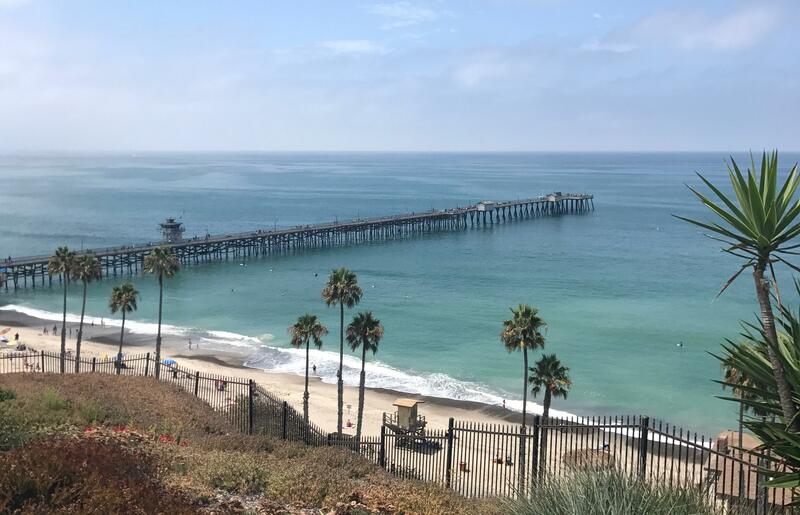 ➜ Nearby: East of Dana Point Harbor, you’ll find Doheny State Beach, a south-facing beach popular with novice surfers and families enjoying surrey rentals and picnics on the 5-acre lawn. ➜ While the name Thousand Steps Beach is hyperbole, the downward trek to get to it is not for the faint of heart. A little more than 200 uneven concrete stairs lead visitors to what feels like the county’s last secluded beach—you could say the steps act as gatekeepers to this hidden treasure. Once at the bottom, you’ll find volleyball courts and tide pools to the north and a cave for exploring to the south. The waves and undertow can be overwhelming, so if you’re looking to swim, go elsewhere. The beach can be tricky to find, but worth the search. Park (meter-free!) along Coast Highway near Ninth Avenue; the stairs are located at the intersection. ➜ Nearby: You’ll find Table Rock Beach to the north—a charming, small beach with tide pools and picturesque rock formations, accessed by a steep wooden staircase. If you’re feeling adventurous, scramble up the rocks on the south end and discover a hidden cove and a rock arch. ➜ If you like your beaches quiet and largely undeveloped so you can focus on the ocean cliffs, sea creatures, and tide pools, you will delight in the open space and 3.2 miles of coastline at Crystal Cove State Park. Take advantage of a guided tide pool walk, offered year-round near Pelican Point, or meander the trails and pathways on your own. Head to the Historic District to immerse yourself in the 1930s and ’40s era among the vintage cottages, or spend a day in the water at Moro Beach (the iconic stretch of sand you brush up against heading down Coast Highway). Parking is $15 flat at any of the six lots, and the money benefits California State Parks. ➜ There’s something romantic about Victoria Beach. The long stairway that provides public access to the sand is hidden along Victoria Drive and Sunset Terrace among multimillion-dollar Laguna Beach mansions. Once you reach the bottom and walk out toward the rocks, Victoria Tower, aka La Tour, comes into view on your right. The medieval-looking structure was actually built in 1926, but even after you read up on its disappointingly straightforward history (it provided beach access via spiral staircase for the house above), it still feels like you’ve stepped into a fairy tale each time you see it. ➜ Nearby: Wood’s Cove is a tiny speck of a beach that all but disappears during high tide, but its small size and seclusion belie its transcendent splendor. 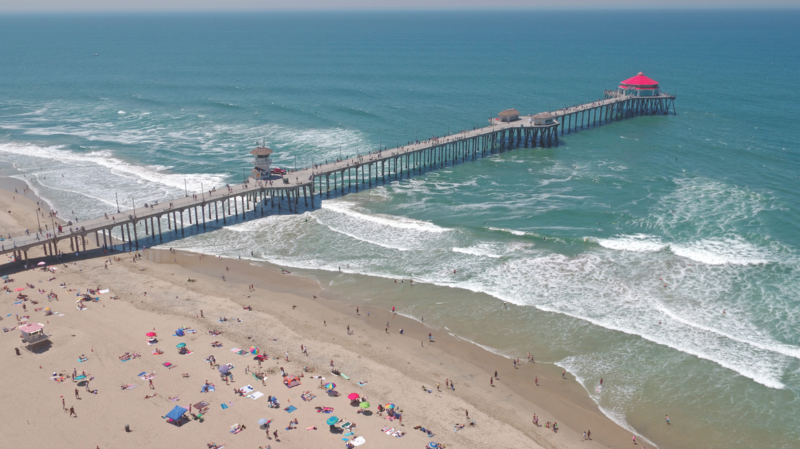 ➜ One of the most popular beaches in Orange County (for good reason), Newport Beach is known for its historic pier and miles of surf and sand along the peninsula. You can easily make a day of strolling or biking along the boardwalk between Newport Pier and Balboa Pier, or head farther south and witness The Wedge during a big southern swell. The usual boardwalk fare is a given, but we recommend checking out Fly ‘N’ Fish Oyster Bar & Grill, Laventina’s Big Cheese Pizza, and Dory Deli. If you get sick of staring at the waves (yeah, right), head to the other side of Balboa Peninsula to play at the Fun Zone, rent a Duffy boat, or take the ferry to Balboa Island. Parking anywhere on the peninsula can be maddening during summer weekends, so use a ride-sharing service or go off-season. ➜ We have few small, intimate beaches here in Southern California, but Crescent Bay Beach fits the bill. This shallow, picturesque cove spans just a quarter mile and is a favorite among the snorkeling and diving crowd. It’s easy to spend an hour floating and bobbing in the gentle aquamarine waves. 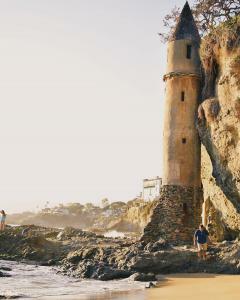 To access this north Laguna Beach dream, turn west onto Cliff Drive. There’s no lot, so parking can be a hassle on busy days, but a little patience pays off. Once parked, you’ll see a paved ramp that will lead you down to the middle of the cove. ➜ Nearby: Shaw’s Cove is an even smaller, more protected area directly to the south. The 500-foot-long beach is accessed by a short stairway off Cliff Drive and is a popular spot for scuba lessons. ➜ Often overlooked by tourists, Aliso Beach Park offers everything from fire rings and tide pools to a playground and amenities such as public restrooms and a better-than-average food stand known as The Sands Cafe. This quiet little beach is also known as one of the best skimboarding spots in Southern California (Page 72) because of waves that break hard and close to shore. Another perk: The parking lot ($1 per hour) is steps from the shore, with another lot on the other side of Coast Highway (a pedestrian tunnel runs under the highway). 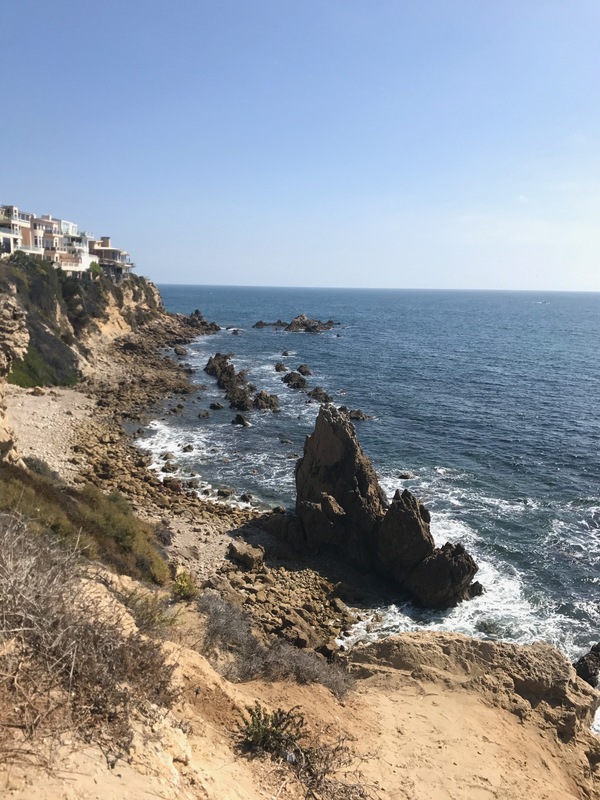 ➜ Nearby: To the north, adjacent to the Montage resort, is Treasure Island Beach, one of the most beautiful spots in Laguna Beach thanks to the greenery and walkways that provide endless panoramic photo opportunities. Don’t miss the tide pools and natural arch. Marina Park Newport Beach. Photograph by Priscilla Iezzi. ➜ For some, a beach without waves is barely a beach at all. But for families with small children, these safe havens provide a great, worry-free environment where everyone can splash around and soak up the sun. 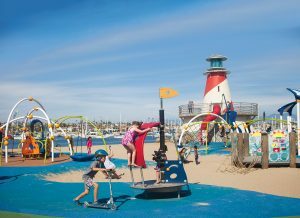 In Huntington Beach, Seabridge Park offers grass, trees, a playground, and a sandy beach in the harbor. 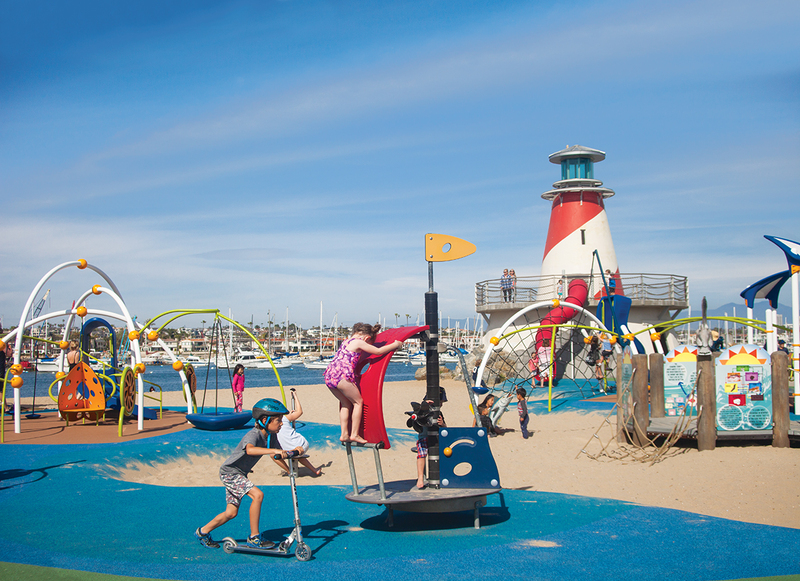 Marina Park in Newport Beach has a modern play area right on the sand, as well as kayak and SUP rentals. Baby Beach in Dana Point Harbor boasts free parking and proximity to the Ocean Institute. Next articleThe 8 Best Places for Corn on the Cob in O.C.